Team Nigeria has now won five gold medals at the ongoing African Senior Athletics Championship in Asaba, Delta State after the trio of Ese Brume, Onyekwere Chioma and the 100m female team won gold in their respective events on Day 3 (Friday). 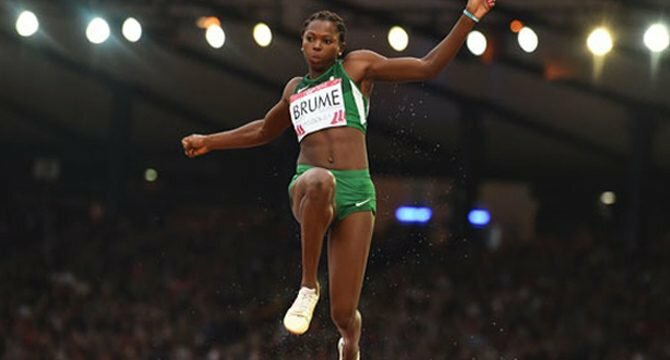 Ese Brume clinched Nigeria’s first gold medal of the day in the Long Jump event in 6.83m ahead of silver medallist Marthe Koala of Burkina Faso (6.54m) and bronze medallist Lynique Beneke of South Africa (6.38m). In the Discuss Throw event, Onyekwere Chioma (58.09m) and Okoro Chinwe (57.37m) won gold and silver medals for Team Nigeria respectively with South Africa’s Ishke Senekel (53.82m) taking bronze. Nigeria thereafter took her gold medal haul to five following the feat of the 4X100m women’s team in the final. The team recorded a time of 43.77s to finish ahead of Ivory Coast (won silver with 44.40s) and Kenya (won bronze with 45.58s). Team Nigeria’s 4X100m men’s team could only settle for silver in 38.74s behind South Africa (won gold with a time of 38.25s), while Ivory Coast clinched bronze in 38.92s. Yinka Ajayi had earlier won bronze in the 400m with a time of 51.34s behind silver medallist Christine Botlogetwe of Botswana (51.19s) and gold medallist Caster Semanya of South Africa (49.66s).